So often, Mexican meals come laden with added sodium and saturated fat. Learn how to bypass the fried tortillas, sour cream and cheese and still enjoy the robust flavors of Mexican fare. When you make a few heart-smart choices, Mexican food can be tasty, fresh and healthy. Dietitian Kate Patton and intern Sara Saliba with Cleveland Clinic’s Section of Preventive Cardiology and Rehabilitation offer heart-smart tips for restaurant dining and at-home cooking. Pick corn tortillas over flour tortillas. Corn tortillas are more natural and less processed, making them a good source of fiber and magnesium (great for maintaining healthy muscles), not to mention they are significantly lower in calories, saturated fat, sodium and sugar compared to flour tortillas. Ask your server not to bring fried tortilla chips to the table. Instead, order some grilled shrimp or veggies for appetizer. The extra protein and fiber will help you feel full. Pass on carnitas (fried beef or pork) and chorizo (sausage). Instead, opt for a leaner grilled chicken breast or grilled fish. Sub out full-fat sour cream and cheese. Try adding salsa, pico de gallo, cilantro or jalapeno peppers for a burst of fresh flavor. If you do order sour cream, be sure to request a low-fat option and serve on the side for portion control, or, better yet, guacamole for a boost of heart healthy monounsaturated fat. At home, switch plain Greek yogurt in place of sour cream for an add-on that’s lower in fat and packed with protein. Choose fajitas over quesadillas. Instead of ordering quesadillas, tortillas filled with meat and lots of cheese, opt for chicken fajitas, marinated grilled chicken with onions, green peppers, lettuce and diced tomatoes wrapped in a soft corn tortilla. Think salad. Choose a taco or fajita salad over tacos, and do not eat the fried shell that comes with it. Choose sauces wisely. Choose sauces that are tomato-based over creamy or cheese-based sauces. Side-step extra saturated fat and sodium. Pass on flautas, chimichangas and burritos. Instead, order chicken or beef enchiladas with salsa or red sauce. Go for unfried beans. Instead of refried beans, order a steaming bowl of frijoles a la charra (pinto beans in a savory broth), black beans or Spanish rice. Bonus: Made with tomatoes and peppers, a side of Spanish rice adds immune-sustaining vitamin C.
Char salsas. To achieve maximum flavor, try dry-roasting your tomatoes, onions and chilies. This packs in the flavor, with no need for added fats. Seek balance. Mexican cuisine revolves around food group balancing. Serve up a protein-packed bean dish, whole grain brown rice or corn tortillas and a variety of fresh salsas while avoiding large amounts of red meats. Spice it up. 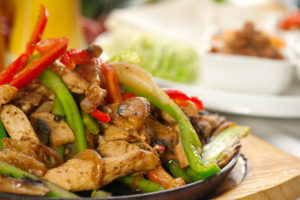 Mexican food is famous for its use of flaming hot spices and variety of fresh seasonings. Chilies are known to boost your metabolism. Season your dishes with Mexican spices such as cinnamon, allspice, oregano and cloves for a healthy, flavor-packed dish. The fresh flavors are satisfying, which means less likelihood of craving unhealthy foods later. Eat green. Mexico farms produce pumpkins, cacti, tomatoes, wild herbs and zucchini. Including a variety of greens in your dishes will keep your meals low in fat and high in fiber as well as vitamins and minerals. 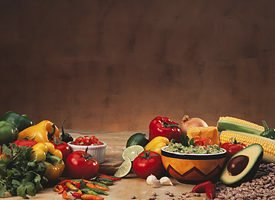 Mexican cuisine commonly features avocado. Add some avocado slices to your main dish for heart-healthy monounsaturated fat, which can help lower cholesterol when used in place of saturated fat. Reinvent the taco. Tacos do not need to include meat. Stuff a corn tortilla with some of your favorite grilled veggies. For protein, add tofu, black or pinto beans for a “meaty” texture and top with a fresh homemade salsa. Incorporate seafood. Grab a few corn tortillas and fill them with grilled spicy shrimp or fish, such as salmon, which is packed with protein heart-healthy omega-3 oils, for seafood tacos. Bank on beans. Mexican cuisine features a vast array of beans, including black beans, pinto beans, black eyed beans, lentils, and chickpeas. Beans are packed with protein, fiber, and can be prepared in so many ways, including baked, boiled and pureed. Include them as a side dish or meat alternative. Add seeds. Seeds were once staples to the Aztec diet, and are making a comeback thanks to their outstanding health benefits. Amaranth seeds, for instance, are packed with protein, fiber, calcium, healthy unsaturated fats, iron, magnesium and phosphorous. They also contain manganese, which acts as an antioxidant, supports bone health and energy metabolism and aids in wound healing. Other high-nutrient seeds often used in Mexican cuisine are pumpkin and chia seeds. Sprinkle any of these seeds on salads, salsa, bean or rice dishes for a nutrient boost.